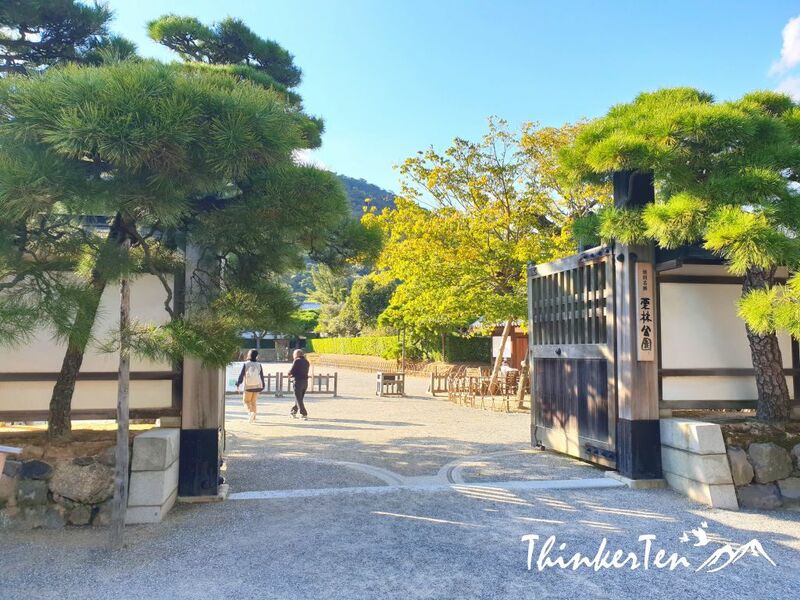 One of Takamatsu (in Kagawa Prefecture, Shikoku) top attraction is Ritsurin Garden, the Japanese style garden built by the local feudal lord during the Edo Period. It also gained more popularity after the garden was awarded three stars as a place worth visiting by Michelin Tour Guide in 2009. 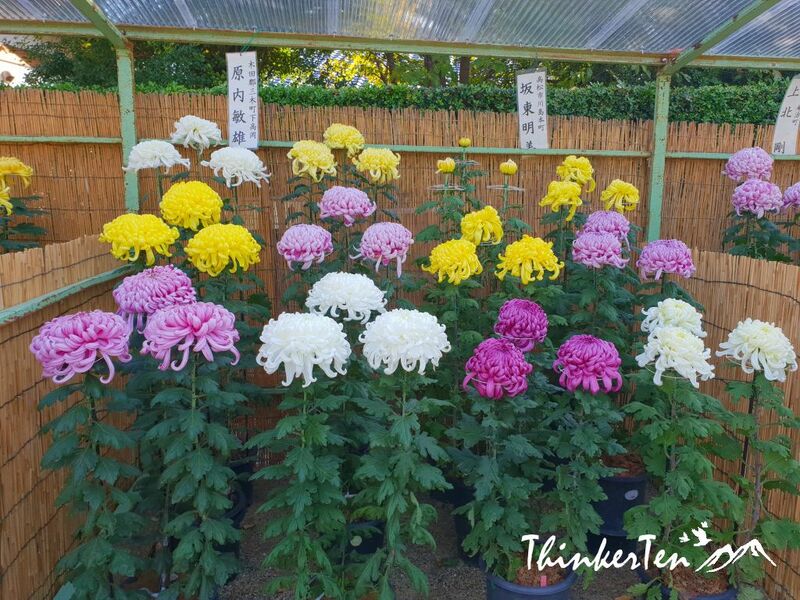 There are Chrysanthemum flowers widely decorated in front of the park, garden or even home in autumn. According to my host mother in Japan, Chrysanthemum also means longevity. Chrysanthemum flower also is known as “kiku” in Japanese is the symbol of autumn in Japan. In fact, every season there is a flower representing it, such as sakura/cherry blossom in spring and ume/plum flower in winter. 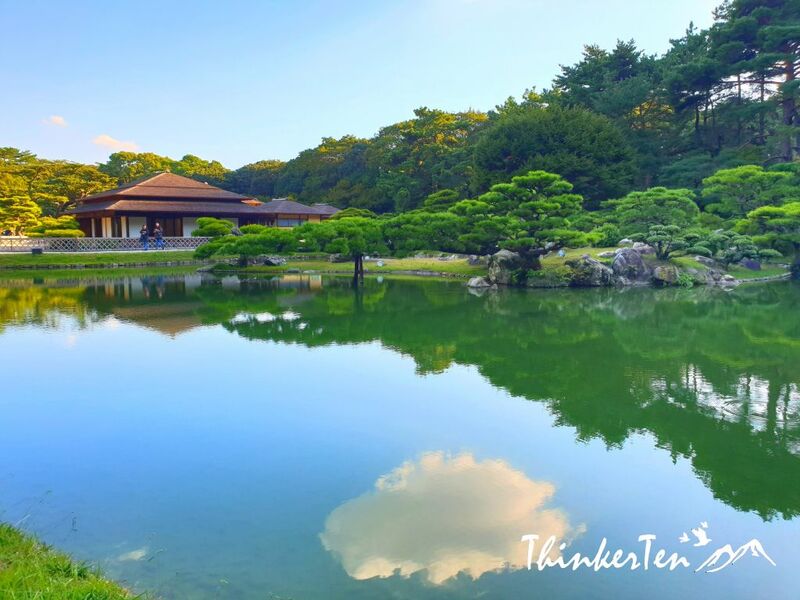 This park also called as Daimyo Garden which consists of 6 ponds and 13 hills with Mt Shiun in the backdrop. Daimyo refers to great lords in Japan. 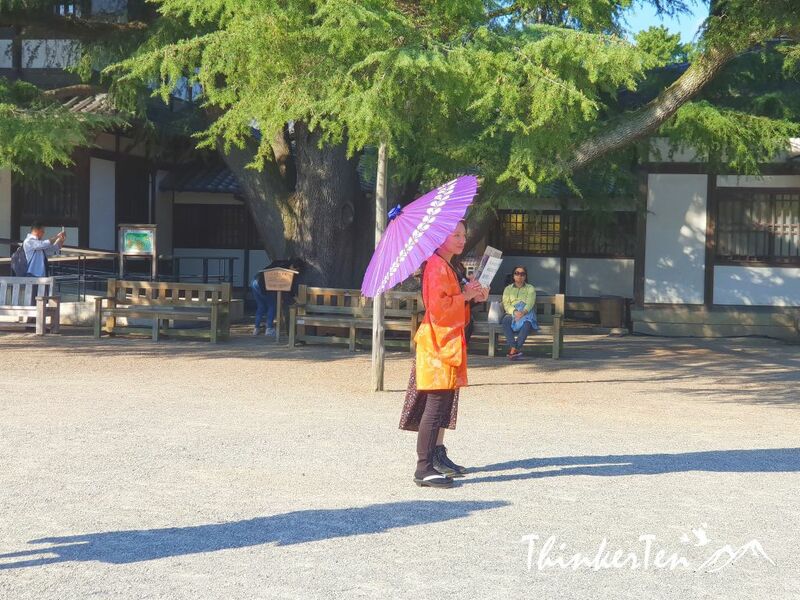 At the entrance, you are welcome to rent kimono costume and walk around in the garden and shoot pictures with the Daimyo Garden which only allowed to enter by the elite in ancient time. 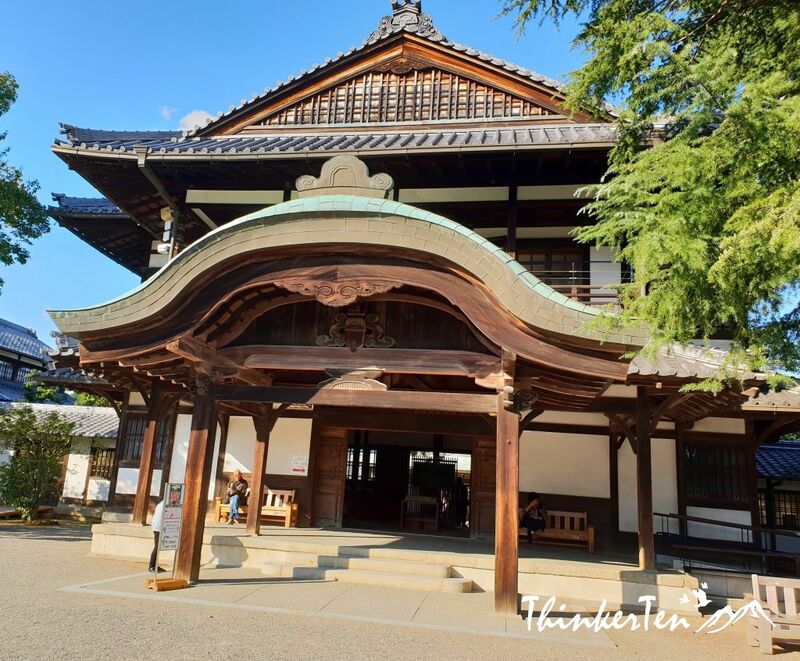 Not far from the entrance, you see Shoko Shoreikan, which is an information hall for Ritsurin Garden’s history and local traditional crafts. 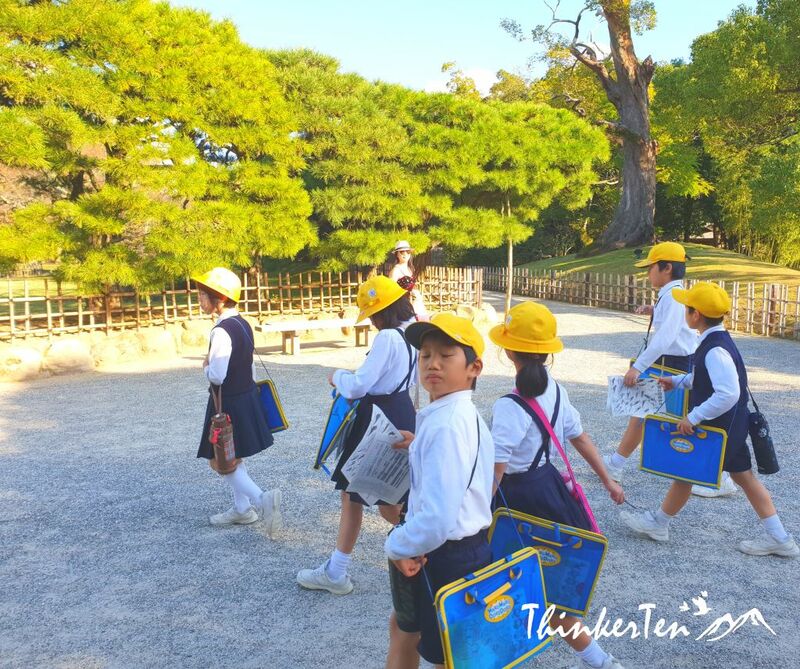 I spotted a few groups of school children with yellow hats having an excursion in Ritsurin Garden. This is one of the most recognizable features for primary school children. The yellow color usually is for the first grader as yellow can stand out more and boost public awareness to be extra careful when they walk or cross the street. Cherry trees are planted in the north garden and south garden. In spring, the park is famous for cherry blossoms. Trees at the park and the scenery of autumn leaves on Mt. 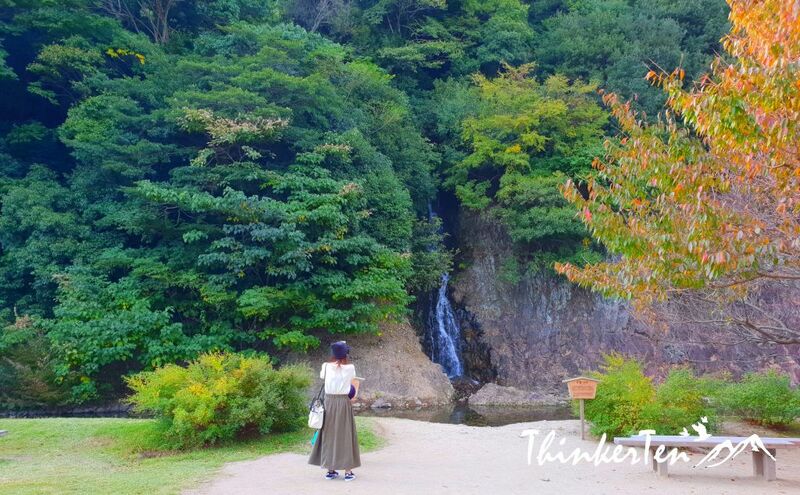 Shiun are worth seeing in autumn but we are here too early so we missed the red maple leaves. Mid of November would be great timing to see the red maple leaves in Ritsurin Garden. Ritsurin garden has the word “chestnuts”/Ritsu 栗 in its name, but you see more no chestnuts and a large number of pine tree in the garden. 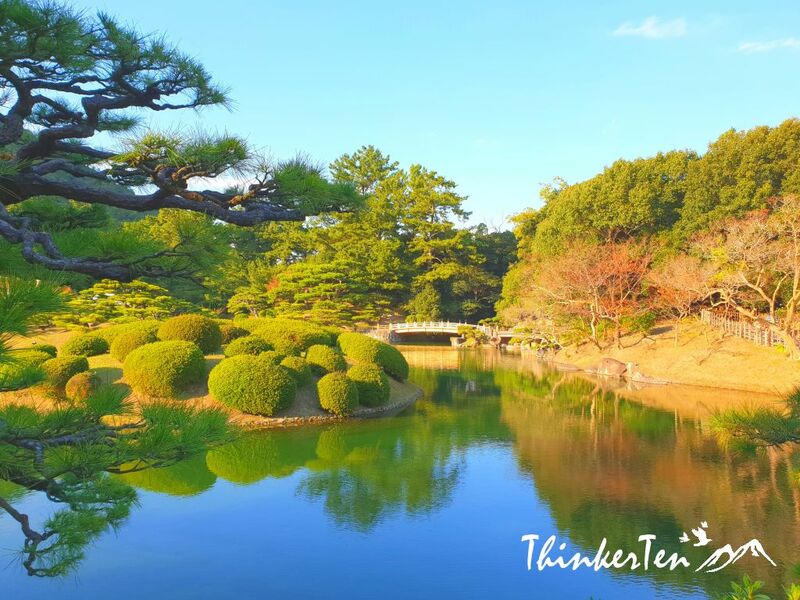 The over 1,400 pines attract visitors to the garden year round and make Ritsurin Garden Japan’s foremost pine garden. 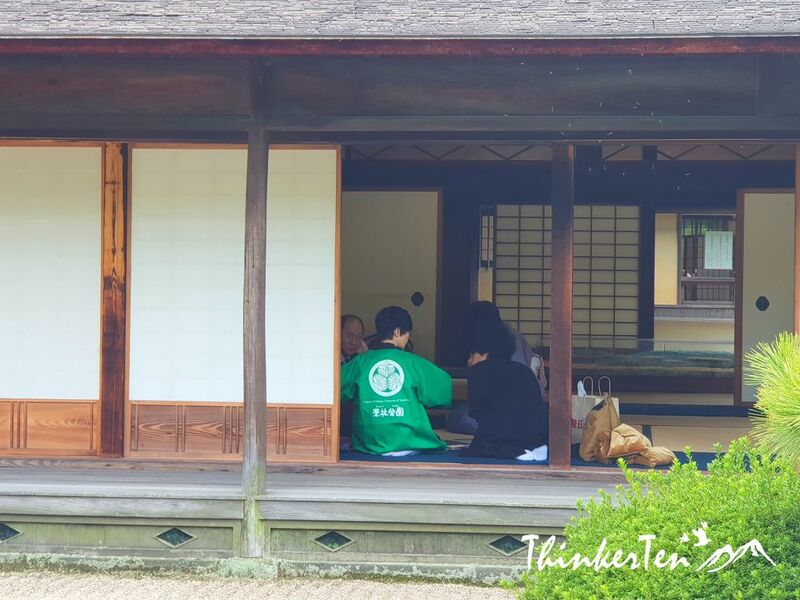 You can experience the tea ceremony with the green powder matcha here with a piece of Japanese wagashi/Japanese traditional snacks. Additional fees are needed. 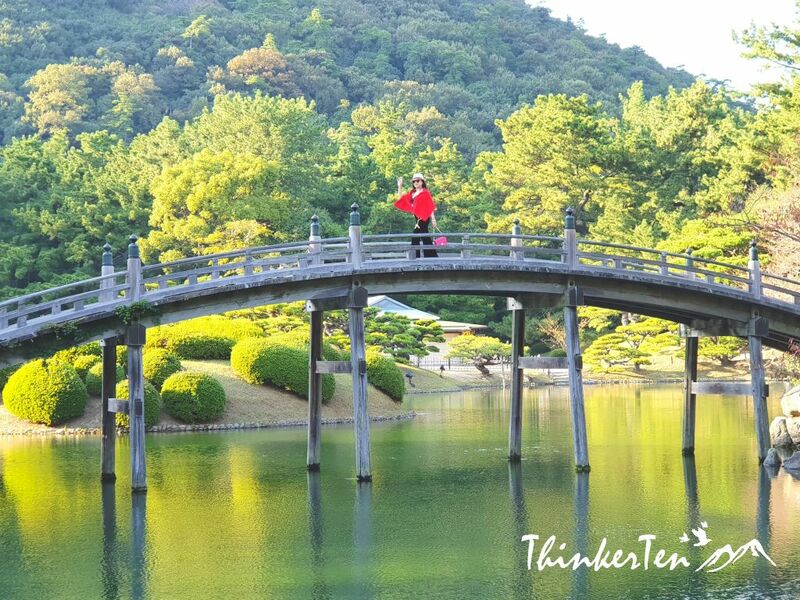 Wasen Boat Ride is another way to see Ritsurin Garden with a different perspective from walking on the path in the garden. Passengers are all seen wearing the traditional straw hat which makes the whole place even prettier. 610 yen/USD 5.40 for adult and 300 yen/USD 2.70 for children. 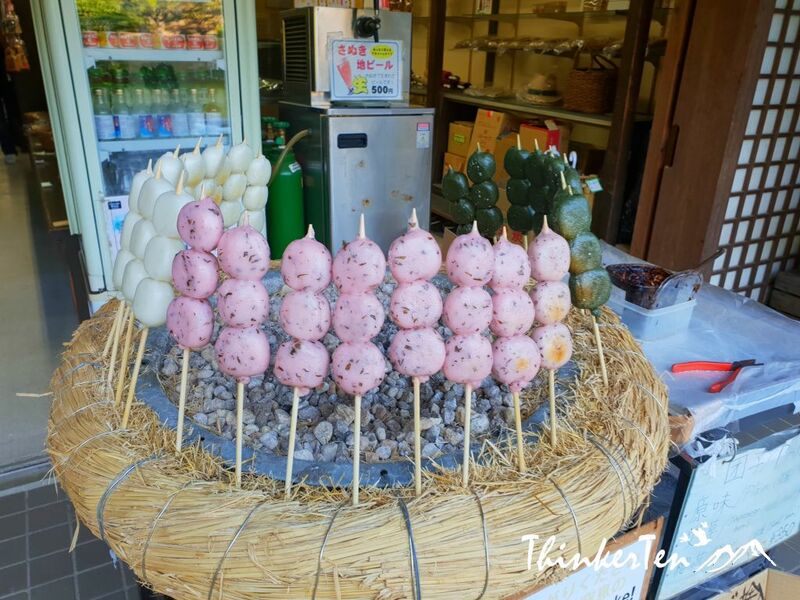 Dango on the stick is grilled over on small fire sold in the little souvenir shop in Ritsurin Garden. There are 3 flavors, the original is white color, pink is sakura flavor and the green is yomogi (mugwort) grass flavor. 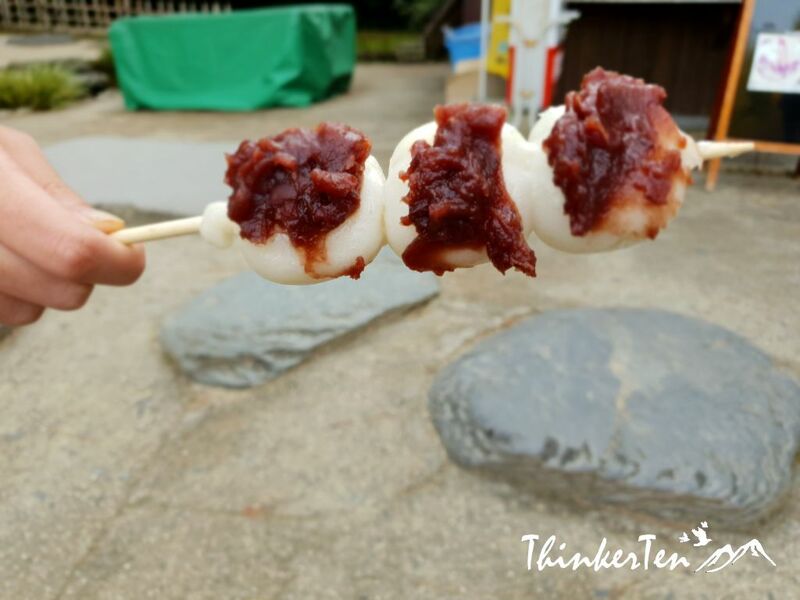 “Anko paste”/red bean paste are added on top before serving. Adults 410 yen (USD 3.65), Children (Elementary & High school) 170 yen (USD 1.50). Even you are a foreigner you are entitled to elementary or high school price if you are student. 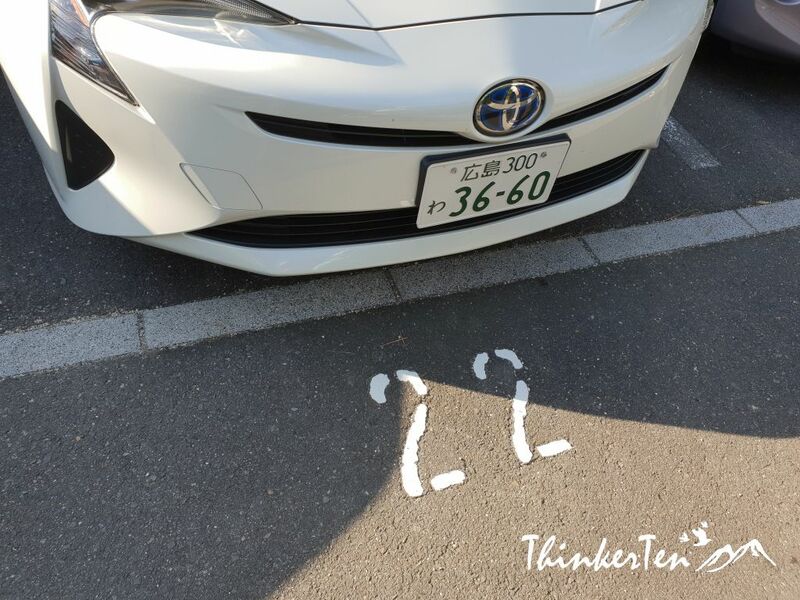 There are parking lots outside Ritsurin Garden. 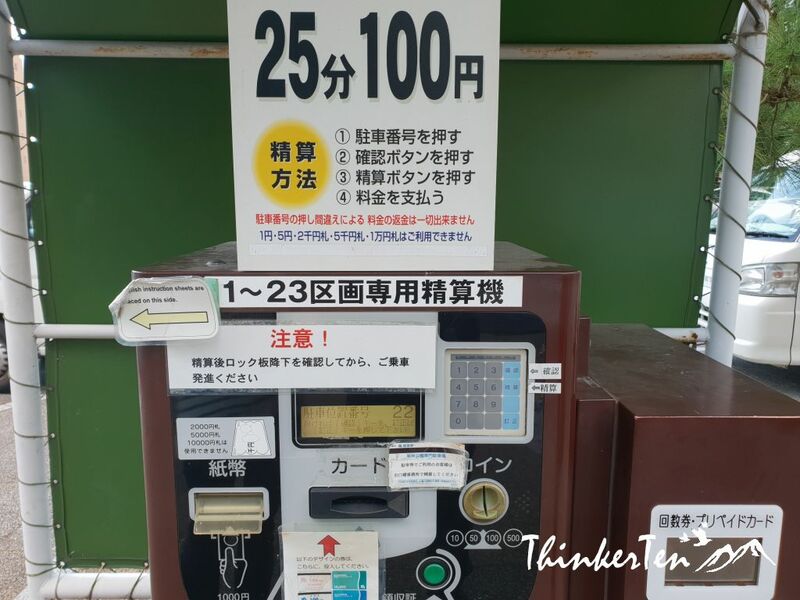 100 yen /USD 0.90 for 25 min. Before you leave, find the pay meter. Most machines accept 1,000 note and coins. Go to your car space and make sure the flapper at the bottom is down before your drive. Drive away promptly as you don’t want to have the flapper up again, some machine has their flapper time-based. 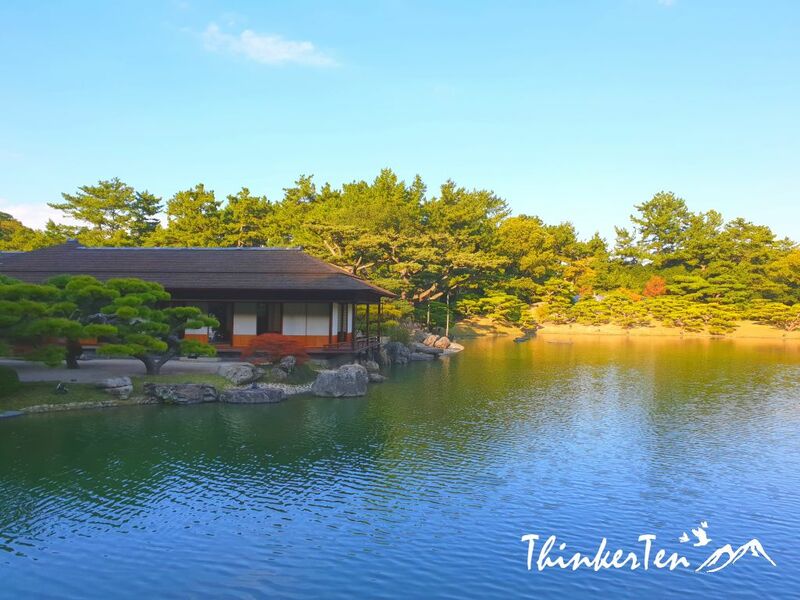 Ritsurin Garden is Japan’s largest Cultural Property Garden that has been handed down since 400 years ago. It is leisure to walk around these ponds and hills which were constructed beautifully. 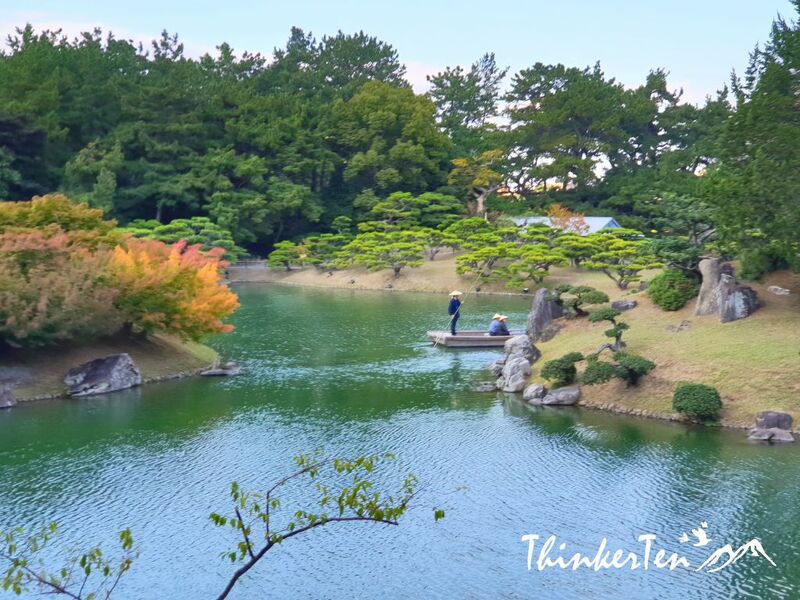 A wasen boat ride is another interesting way to explore Ritsurin Garden, you got to see a totally new perspective from walking the park’s path. No wonder this place is named as a Special Place of Scenic Beauty by the Japanese government. If I was here two weeks later, the whole backdrop would be even more stunning with the maple leaves turning yellow and red. Wow! You have such beautiful photos of this place! I’d love to see it in person one day! Just stunning. So green! Yes, it is pretty green but I hope to see some red maple leaves on the backdrop. I was a bit too early during fall season. Such a pretty place. I love all the plants and water along with the food. ah japan! always a lovely place to see! and happy that it is more affordable now than ever! Japan is so affordable these days especially outside of Tokyo and Osaka. Do visit Japan countryside as it has more to offer and less crowd. I’ve never gone to Japan but its so high on my bucket list. Maybe for honeymoon! This looks like a truly beautiful Japanese garden/Park, and such a detailed post. Amazing! Japan is a great country to visit especially for honeymoon couples from Asia. Wow these places are amazing! I have yet to visit Japan but if I were given the chance to do so, I’ll be sure visitng these places! Lovely country! Best time to visit Japan is during Spring and Autumn. In spring you get to see the cherry blossom all over parks and streets. In autumn, you see forest leaves turning red. I love the photography in your post, they capture the beauty of Japan very well! Wow these are very affordable. I want to go to Japan and I will make sure to visit these places when I get to go over there. The garden is well maintained and frequently has workers to cut and trimmed the trees. When I was there I saw workers working at some part of the garden. I love the picture of the cloud reflecting in the pond. This looks like a beautiful place to visit! I would love to go there one day. There are so many beautiful things to see. 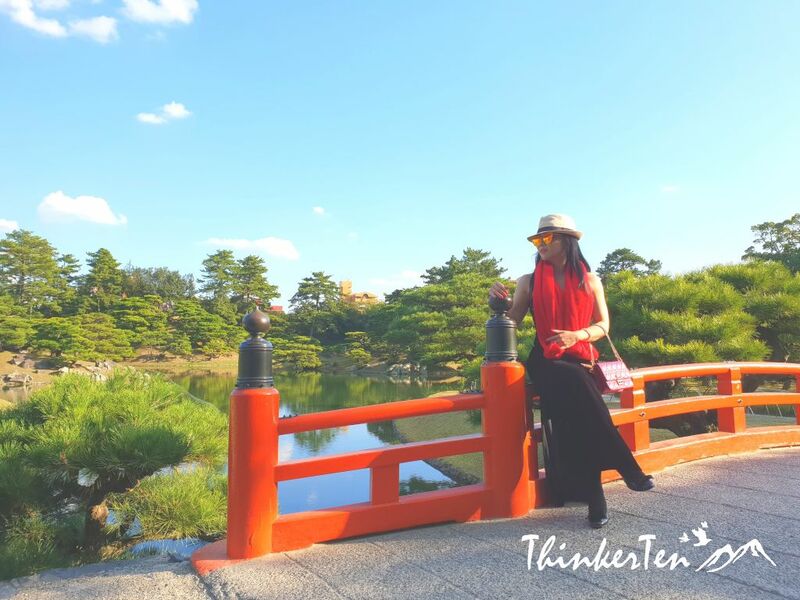 Ritsurin is one of the best scenic place in Japan showing Japanese style garden. This garden used to own by the Daimyo lord few hundred years ago and only open to the elite society. Those are gorgeous flowers! 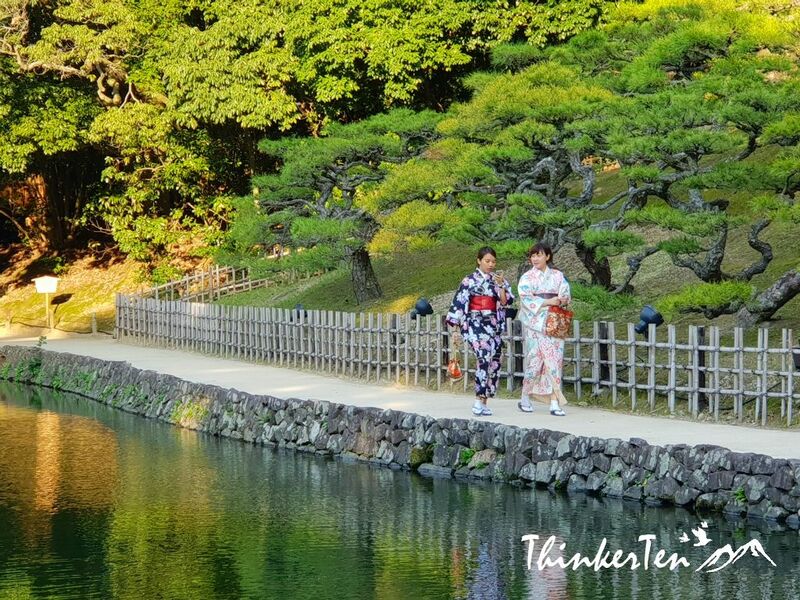 And how cool that you can rent a kimono as you peruse the gardens. This sounds like a really neat trip with lots of cool experiences. Renting a kimono really is a good way to walk around the Japanese style garden and shoot picture. I love botanical gardens. They typically are so peaceful and beautiful. This one seems to be just that. I had no idea about the yellow caps. How adorable. The yellow cap show a distinctive feature of the primary 1 school children in Japan. It mean to show to the public these are primary 1 school children and please pay attention to them, especially on the road. I never pictured Japan to be so beautiful. I always picture a very busy city when I think of Japan. It looks so beautiful! I would love to visit one day! I suggest the best time is during fall season, that way you get the see more red and yellow in the backdrop. This is gorgeous! so much to see. I like the little tidbit about the yellow hats in first graders. We’ve never been to Japan but would love to visit. What an incredible travel experience. I don’t really use the phrase picture perfect very often – but this place is gorgeous! I absolutely love gardens like this! What a beautiful, peaceful garden. I would love to visit Japan one day to explore its culture and beauty. I love visiting the gardens in my local area and know I would enjoy the Ritsurin Garden, as well. 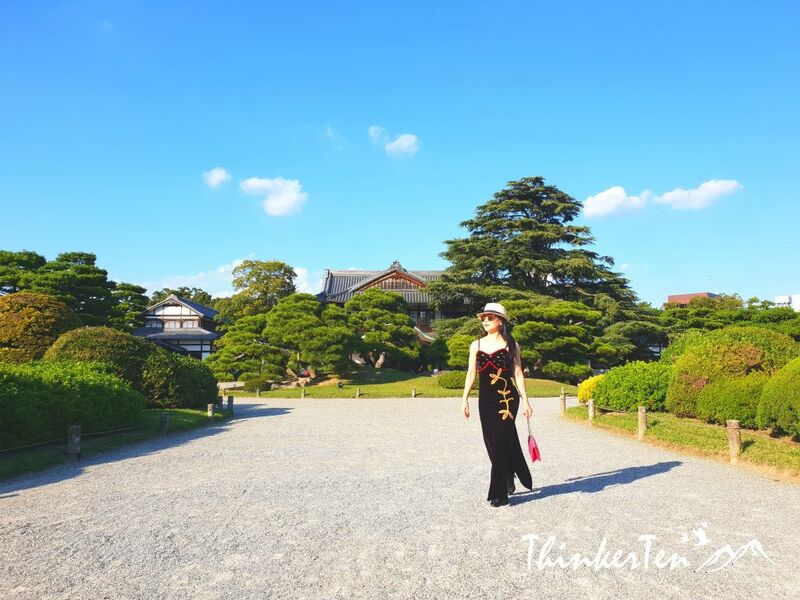 I would love to rent a kimono to walk the grounds and participate in a tea ceremony!!! 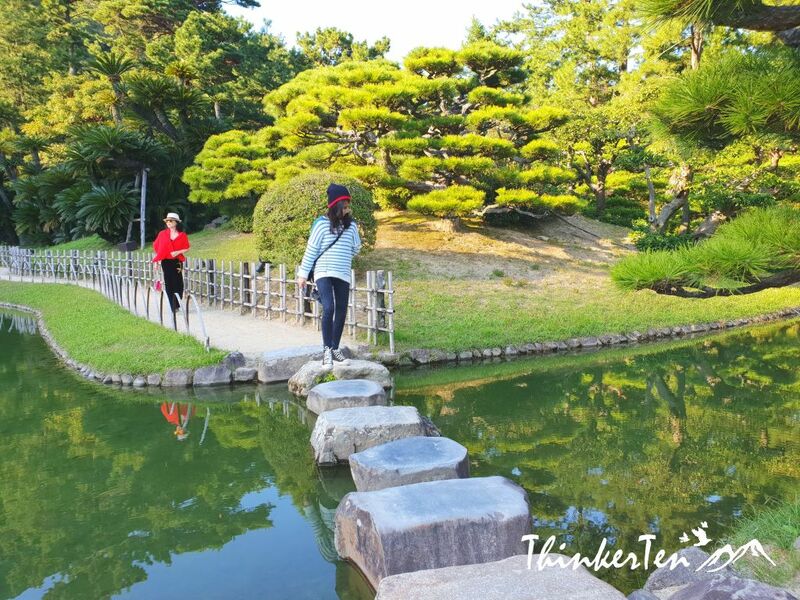 That should be the ultimate way to explore Ritsurin Garden for any foreigner to experience a Japanese Garden! Kimono and tea ceremony, it is actually in a pair! So many pretty photos. I like that you can rent a kimono to go inside, though it was once only for the elite. 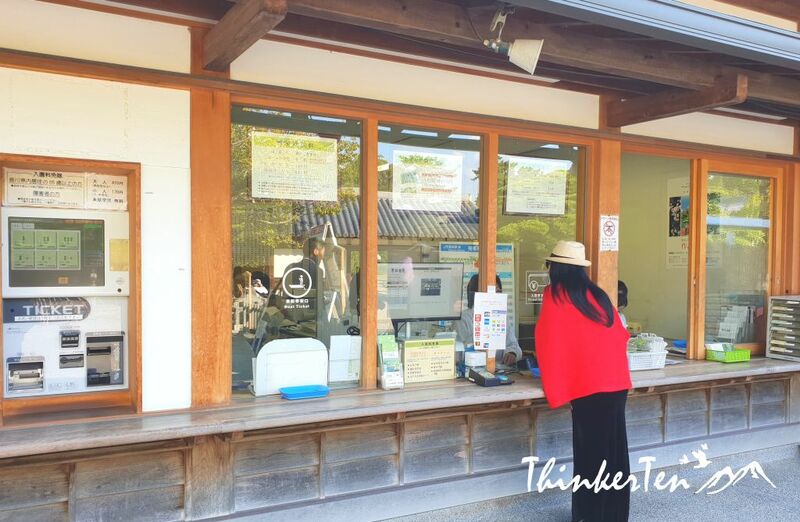 These day everyone can just pay a visit to Ritsurin Garden as it is open to public. Yes, I think the kimono really suit the backdrop well. Wow! I have ben to Japan but I didn’t get to explore these awesome places. Well, I guess, it is such a good reason to go back. Yes, another reason to visit Japan but explore different region. Yes, nowadays you can rent kimono is many of the famous attractions. It is really a joy to look at this piece of arts. This is really cool! I’d love to visit Japan one day and will keep this on my list! The pictures that you posted are gorgeous! The vibrant colors of the trees are amazing. I’d love to visit there one day, thanks for sharing!